**Monday's menu: Curried squash soup (crockpot). Cornbread. Cabbage salad. **Ho-hum: Should have stuck with my sweet potato coconut recipe, because this new version was less pleasing. Not bad, just not fab. **Happy crunching: A few of us must have been craving a mid-winter veggie crunch, because the cabbage salad was very popular. Chopped cabbage with grated rutabaga and carrot in a lemon dressing. **Tuesday's menu: Red mexican beans. Baked rice. Tortillas. Cheese. Leftover cabbage salad. **Super-flash turnaround: The food was prepped and waiting for us when we raced through the door at approximately 5:15. We ate tortillas stuffed with rice, beans and cheese in about ten minutes flat between swim lessons and soccer. It wasn't pretty. Everyone required a second supper when we all returned home around 8pm. **Wednesday's menu: Rice pilaf (crockpot). Leftover cabbage salad. **Epic meltdown: The mixing of leftover rice into cooked lentils in order to create the finished pilaf sent our youngest into full-on suppertime revolt. His revolutionary chant went something like this: "Not mixed together! PLAIN! Not mixed together! PLAIN!" He had to be removed from the table temporarily, until the revolt was quelled, though he never did try the pilaf, which was generally accepted by everyone else as satisfactory vegetarian fare. Thursday's menu: Chili. Steamed brown rice. Leftover squash soup. Kale chips. **Hello leftovers: Chili made of leftover beans, plus corn and roasted red pepppers from the freezer. One child preferred the squash soup. **Rice fail: Should have baked it in the oven. Used the stovetop so the oven would be free for the kale chips, and the brown rice took much longer than anticipated. And was the consistency of porridge. Ugh. 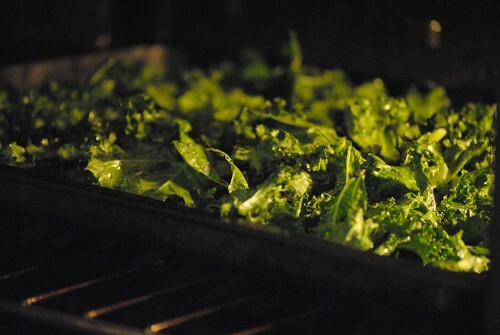 **Mini-recipe: Kale chips. I used Smitten Kitten's recipe as inspiration (kale chip recipes practically infect the internet, all with different baking times, oven temps, and methods; allow me to add to the epidemic). Method: Rip kale leaves into chip-size portions (minus the thick stems). Wash and dry in a salad spinner (just because it's easy). Toss in a big bowl with 1-2 tbsp olive oil and salt to taste (1 tsp is way too much!). I added 1 tsp of red wine vinegar to make salt-and-vinegar kale chips. Spread on a baking sheet and bake at 300 for 20 minutes or until crispy. You're looking for a crispy almost translucent chip that reminded my kids of seaweed (which they love). This is far and away the best use for kale I've yet to discover, though it did taste best fresh out of the oven--delicious and salty and melting on the tongue. Liked by two out of four children and two out of two adults. **Friday's menu: Pizza night at church. I made a sour cherry/plum crisp to share. **Because Mama doesn't love pizza: My bedtime snack was a feast of pita bread, hummus with hot sauce, carrots, and pickled dilly beans. And a glass of white wine. Then I fell asleep while watching a movie with Kevin. Sigh. Friday night. **Weekend kitchen accomplishments: Four litres of yogurt. 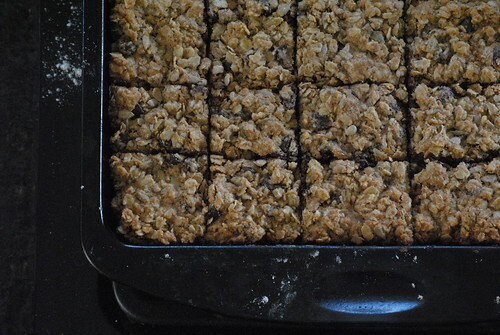 Chocolate sunflower cookie squares. (Opening photo--and hey it looks like a real food blog photo, doesn't it?! ).